On what basis do you make a decision: Gut feeling or figures/data/facts? Do you use all the information you have at your disposal? Do you work with probabilities or mean values? The tasks in risk management are getting bigger and bigger, but also the possibilities to control them. On the one hand, new business models or modular structures force a long-term and comprehensive risk assessment at a very early stage. On the other hand, modern data collection offers new possibilities for assessing risks. The question is: Do I use this potential in my analysis? We support you with our experts on the way from the first data viewing and evaluation, via parameter determination and model creation to a complete and comprehensive statistical risk analysis. The results support your management and/or convince your customers. Secure your decisions and make full use of your existing but often undiscovered information and data. The rule here is: make a decision, don’t let it happen! For almost every type of information there is a possibility to consider it analytically. We understand risk management as a combination of technical, business and organizational risks. Risk management is more than just an aggregated mean value and then a worst/best case classification: It’s about probabilities. Once the first steps have been taken towards risk management, the advantages quickly become apparent. So let’s tackle it together! Data analysis is often the highest initial hurdle, but one that is worth tackling early. Now is the time to position yourself well and make your data collection and processing future-proof. The following applies: The most complete and complex data collection is not necessarily the most efficient one. Not every effort to obtain or process data is justified. However, even in the concept phase it should be well considered which data will also be needed in the future. 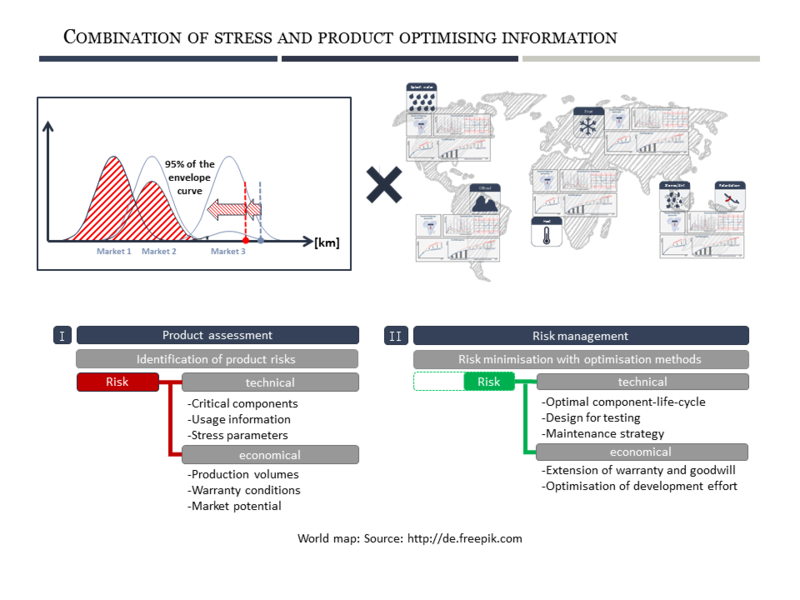 The consideration and evaluation of several risk parameters automatically leads to new methodological challenges. The highest level of mathematics or artificial intelligence is not always immediately required. The methods of multivariate statistics are in most cases well suited to evaluate the risk without unnecessary economic effort. 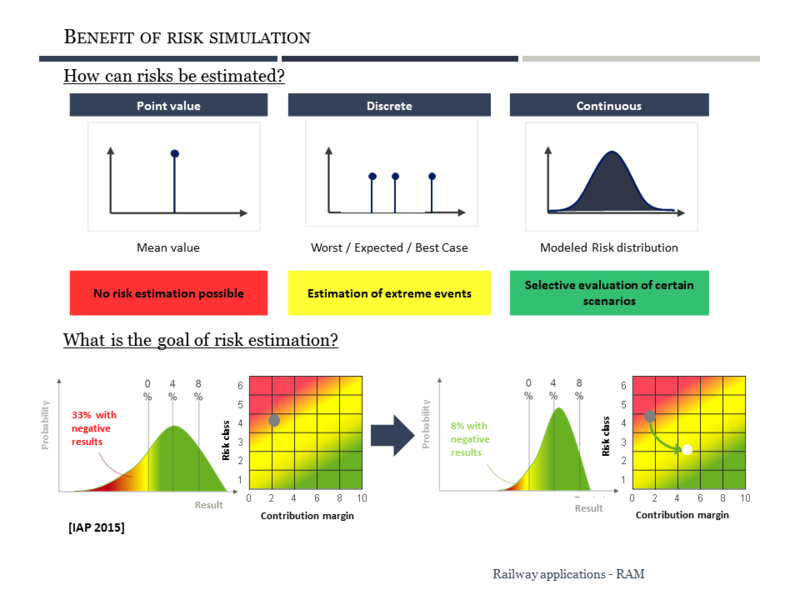 Should an evaluation nevertheless turn out to be more complex, we have a broad repertoire of simulation and optimization methods as well as AI methods to analyze your risk. Unfortunately there is no standard approach, no problem is like the other. The type of analysis chosen is therefore decisive for the success of the model created. The results are available and what now? Conclusions must be drawn from the results and the results validated. 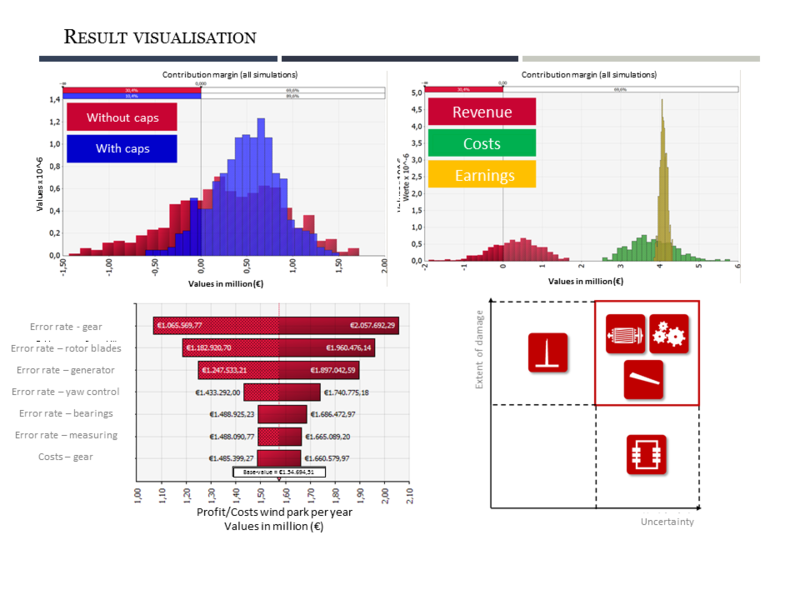 In addition to an easily understandable visualization using distribution functions, risks can also be viewed and discussed at the detailed level. It is important not to lose the data reference. It can also be useful to generate key performance indicators (KPIs) in order to correctly assess the risk. Use the created solid data basis to create helpful simulation results. In addition to the risk assessment, recommendations on how to deal with the risks are of course also expected. A sensitivity analysis helps, for example, to determine the risk drivers. 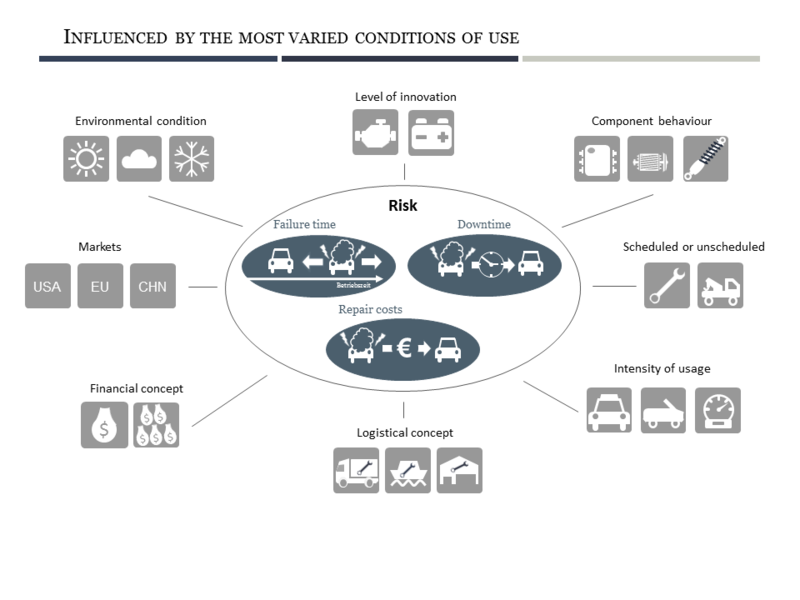 Once the risk drivers have been identified, there are various ways of influencing their characteristics. The results of the risk analysis thus enable you to prioritize your actions. Discussions about modifications, risk surcharges and even exclusions can be conducted much more profoundly based on the simulation results and the benefits of changes can be substantiated with arguments. A consequence of these interconnections is a more difficult reliability analysis by means of classical mathematical and stochastic methods, which results from unclear mathematical expressions, which are not or only with difficulty solvable, complex technical dependencies or simply due to a too high number of components or subsystems. The mapping, simulation and analysis of these complex questions in the technical and economic field form the field of application of Monte Carlo simulation. Monte Carlo simulation is a computer-aided simulation method that can reliably map and analyse even complex interrelationships via a large number of simulated system runs. This is done by means of random numbers with which a random event is generated for each simulation run. A large number of simulation runs are used to develop an estimator that replaces conventional reliability analysis or other analytical calculations. 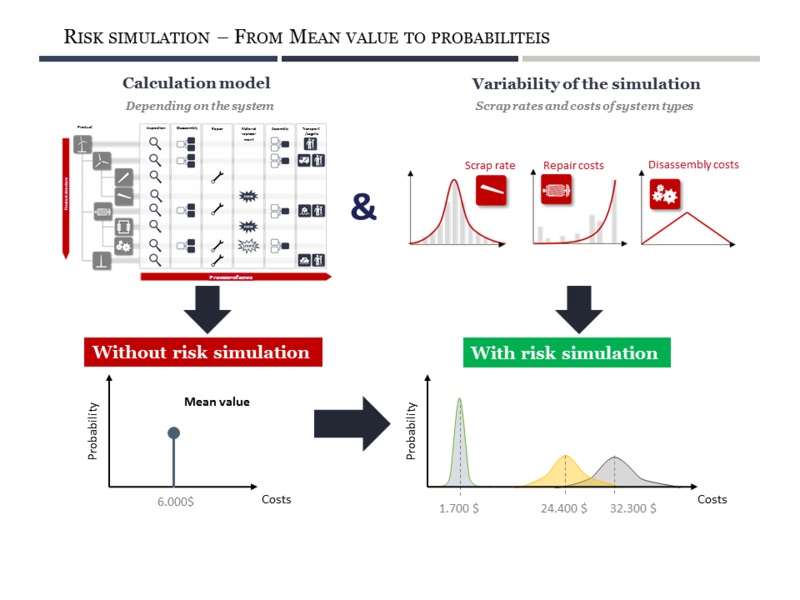 The possible application areas of Monte Carlo simulation are versatile and can be used for a holistic system, reliability and risk analysis (technical as well as economic). Analysis of the availability of technical or organizational units and, building on this, development of an optimization strategy. The IQZ offers you, because of its many years of experience in the field of simulation methods, both the methodical and applied competence for the conception, execution, implementation and support of Monte Carlo simulations in many application areas. The Monte Carlo simulation (MCS), named after the Monegasque district Monte Carlo with its famous casino, is a simulation method for the modelling of random variables and their distribution functions with the aim to solve certain integrals, ordinary and partial differential equations etc. sufficiently exactly by stochastic modelling. Using the MCS, complex systems of equations of a stochastic or deterministic nature, which cannot be solved analytically or can only be solved with great effort, can be solved numerically (“playfully”) in a mathematical context. The “law of large numbers” forms the mathematical basis. A current object of research is the so-called “dynamic reliability theory”. The complex equations of system transport theory used here to describe dynamic system changes can usually only be successfully evaluated using MCS. The Monte Carlo simulation enables you to model real conditions, such as stochastic dependencies, time dependencies, ageing processes and physical influencing variables, without restrictions. In general, it can be said that MCS is gaining more and more importance in industry, since complex and expensive field tests can be replaced completely or partially by computer simulations. Among other things, this has the advantage that material and test costs for field and laboratory tests can be saved, the test conditions are identical and the results reproducible. In addition, the results can be easily compared and analyzed with those of other simulations. The implementation of the Monte Carlo simulation is continuously improved by more powerful computer systems – even with very high simulation runs. In this respect, the results that can be achieved with Monte Carlo simulation are becoming more and more accurate. The quantitative risk assessment (QRA) is used to asses the risk of technical systems taking into account the event and exposure sequences. During a quantitative risk assessment, hazards are identified and assessed, the corresponding event sequences (scenarios) are mapped allowing for the technical safety levels and the resulting exposure sequences are modelled, analysed and assessed on the basis of the site environment. The quantitative risk assessment is often used in practice to analyse and asses hazardous incident sequences with a high risk potential. Methods such as FMEA, HAZOP, event tree analysis, fault tree analysis and Monte-Carlo simulation are used and combined to perform the steps hazard identification and assessment, event and exposure sequence as well as risk assessment. Assessment of external sources of risk (kinds of external effects: pressure wave from explosion, aircraft crash) on the operation of nuclear power plants. Publications on the modelling, analysis and assessment of the external source of risk of pressure waves from an explosion. Do you need a quantitative risk assessment with an evaluation of the risk hazards and risks within the scope of an operating license, new development or change of operations? Have there been any faults/hazardous incidents recently? We can offer the necessary tools, we draft the quantitative risk assessment and help you prepare the necessary documents – get in touch, we will be glad to help. You’ve got questions about risk management? ?